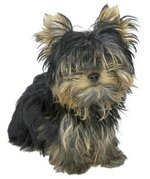 Yorkshire Terriers have long, fine hair that looks beautiful, but gets dirty easily. Many owners who don't want to show their Yorkies trim their dogs' hair short to keep it clean and manageable. This short haircut is called a puppy cut, because it looks like the short hair of a Yorkie puppy. 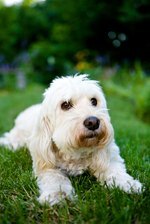 A puppy cut is easy to perform and easy to maintain. Here are some of the tools you'll need. It is imperative that you use dog clippers on your Yorkie. Human clippers might work on their fine hair, but over time you will wear down the motor. A good set of dog clippers should have a powerful motor (up to 3,000 rotations per second) that stays cool over extended use. The two top brands on the market in the United Stated are Oster and Andis. Each brand offers different models -- shop around to see which one fits your needs. A good-quality set of dog clippers will require little maintenance. Look for guarantees on the box or the website that the clippers will stay oiled for up to 100 hours without maintenance. A good-quality set of professional dog clippers will save you a lot of time and effort over several years. Get clippers that are comfortable for you. It's best to buy in person so you can see how they feel in your hand. Dog clippers come with an assortment of blades. The lower the number on the blade, the longer the hair will be when you cut it. A No. 4 blade is ideal for a puppy cut on a Yorkie. It leaves the hair about an inch long, and you can use it on all of the Yorkie's body, except the head and feet. These clipper blades are useful for fine-tuning your Yorkie's puppy cut. They provide a slightly shorter cut than the No. 4. You can use them on a Yorkie's chest and abdomen. The No. 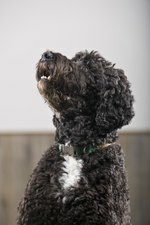 7 is a skip-tooth blade, which has coarse, uneven teeth that are particularly helpful for matted fur. The No. 7F has even teeth that create a smooth, even finish. 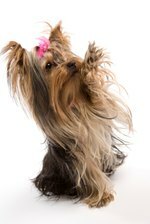 Brush your Yorkie's coat well beforehand to get the best results from the No. 7F. The No. 10 blade provides a shorter cut than the No. 7. You can use it to trim up the edges -- the chin, backs of legs, face and ears. Be careful when using clippers on a Yorkie's face. your dog should be comfortable with the clippers before you try this. You can also use scissors to create a custom cut on the face and whiskers.